About 20 hours into playing The Legend of Zelda: Skyward Sword, one of the Wii's most ambitious games, I shook my head and realized why I was frustrated with a game that I was enjoying. The new Zelda was fun, I thought, but it was also something else. It was formula. It was the fourth formulaic Zelda I had played in five years, the fourth to establish that it's no longer a fluke or a brief trend but instead a realfity that Nintendo's Zelda series is no longer a head-turner of repeated radical change. Zeldas have become James Bond movies, I decided, mid-way through Skyward Sword. They have their own version of the gadgets, the girls and the exotic locales. The Zelda formula, followed with near-perfect faithfulness in the last 10 years, requires a new way of getting around the game's vast terrain (horse? boat? train? giant bird? ); a new batch of dungeons spread through the land, one of which should reward the player with bombs, another with the bow and arrow; a new playable musical instrument in each game (ocarina? conductor's baton? pan flute? harp? ); and so on. As I played the new Skyward Sword, my sense that I might be playing the best video game of the year was at war with my feeling about what it seems this Zelda series had become. Then I played the game for 27 more hours. The Legend of Zelda: Skyward Sword doesn't have a formula problem. It has a formula solution. Nintendo's new epic is a magnificent construction of great design built within an expected framework that first works within expectations and then confounds them. I'm not saying my apprehension was unfounded. This series has indeed taking a slow turn this past decade, but Skyward Sword proves not to be an indicator that that is a problem but a proposition that that can be a good thing. Skyward Sword is a checklist game, one that genuflects toward each Zelda design tradition and then tries to better it. Often, it does. In its first 10 hours, it is a slow starter, establishing its version of Zelda standards; in its next 20 or so, it repeatedly shows off how its version of those standard might, mostly, be better; and in its final 10 it finally defies expectations, remixing the series' hallmark dungeon-exploration progression into something almost unrecognizable as Zelda formula. And then it ends, immediately sorely missed. Along the way to its bravura final act, Skyward Sword presents two major new ideas and gingerly explores the consequences. The ideas: that a Zelda game can be about advanced technology and that a player's decisions can make their Zelda game unique. Skyward Sword, like all Zeldas, stars a hero named Link. As in most, he has to save a woman named Zelda. In this game, Link's hometown is a village called Skyloft that floats among the clouds. Predictably, Link needs to leave his town to explore several regions on the mysterious surface of the world below. He must explore forest, desert and volcano regions, battling through dungeons hidden in each while solving puzzles in the environment with the help of an array of gadgets he discovers along the way. The sky portion of Skyward Sword is similar to the ocean in The Legend of Zelda: Wind Waker. It is huge and pocked with islands to explore. Few, however, contain the delightful surprises or natural beauty of Wind Waker's landmasses and the sky realm of this new game, while beautiful, is the least interesting sector. The land zones, on the other hand, are among the best-designed playing fields for single-player adventure designed in this gaming generation. They are gorgeous, even to eyes dazzled by the HD graphics on competing consoles that the Wii can't generate. They are stuffed with interesting enemies to fight and puzzles that vex. Those elements aren't just in the game's unusual and cleverly-built dungeons. They infest the long lead-ups to dungeons. One of the signature Zelda experiences is to walk into a new, strange land, overwhelmed with confusion about where to go next and what the various seemingly significant statues and doorways and curious trees nearby all mean...only to sort it all out and, within 30 minutes or so, know that formerly mysterious region with the same geographic certainty that a child knows the nooks and crannies of their bedroom. That experience of discovery and comprehension occurs repeatedly in this game and helps elevate the game's dungeons and its pre-dungeon areas to among the best in the series (once you get past the first one, that is, which is unexceptional, I'm sorry to say). Theme Song: Success. The game's rousing main theme is among the finest I've heard in the series and the entire score of the game is suitable to the varied moods in each of the game's diverse regions. The music is playfully interactive in ways that will delight gamers who listen closely to how the music sometimes changes based on what they are doing. The "Vehicle" Not so hot. I never warmed to the big red bird Link uses as his horse-replacement to explore this Zelda's cloudy-lined overworld. The bird is flown with motion controls, steered with tilts and turns of a Wii Remote. It flaps its wings with each shake of your hand. Those controls are simple, as is the experience of flying the bird, which is begging for some added complexity. The game's bird-riding offers none of the varied experience or random surprises of sailing a boat in Wind Waker's occasionally dangerous waters, nor does it enable the range player-driven variation that enabled Ocarina of Time gamers to break up the monotony of long travel by making Epona the horse jump fences and gallop through enemies. Travel on the bird is mostly dull and thankfully usually brief. The Gadgets Well done. All of the old (tired?) favorites don't return and those that do, including the bombs, are used in new, clever ways. Yes, being able to bowl bombs, pocket ones picked from bomb plants and even use them for a method of aerial bombardment are all winning ideas. The new items are mostly good and improved by the fact that, well, you can improve many of them, adding optional extra functionality. The Musical Instrument Mixed results. The harp is played with wafts of your hand. It is used more as a glorified key to unlock new areas than as a player-driven tool for manipulating the state of the game by, say, slowing down time or turning day to night or changing the way the wind blows, which prior instruments did. But disobeying formula is not a bad thing, and I credit the game's developers for enabling the harp to be played, at any time, as a subtle accompaniment to whatever music is playing in the game. The Dungeons Wonderful (after the first one). Continuing a series streak of stunning dungeon design that had been advanced by 2009's under-rated DS game The Legend of Zelda: Spirit Tracks, most of the dungeons in Skyward Sword are ingenious, hand-crafted chambers of puzzles, battles and surprises that cohere into well-paced, brain-tickling levels. They are more satisfying to play than the levels of any other game I've played this year, with the possible exception of Portal 2. And if you're unfamiliar with how a Zelda dungeon works, it's sort of like that opening scene in Raiders of the Lost Ark or any other movie that has an explorer split his or her time getting around traps and using found and brought devices to circumvent traps, open hidden doors and fight monsters, spiders and/or bad guys. I started to notice how much Skyward Sword was tweaking the Zelda formula when I realized I couldn't count the number of the game's dungeons. There might be seven. But you could also argue there are closer to 20, depending on what your definition of a Zelda dungeon is. If it is strictly that Link is in a maze of some sort, and that you have to think carefully about how to get through and, oh yeah, you might gain a new gadget in the process, well then almost every part of Skyward Sword that isn't in the clouds is a dungeon. Almost every place in the game has that Zelda dungeon quality, and by the time you hit the game's final act, you've already experienced more hours of Zelda's version of Indiana Jones-style exploration than you ever have in this series. Skyward Sword's challenge to what the nature of a Zelda dungeon is threatens the safety of the series formula. So does the game's approach to advanced technology. That approach involves two things, the tech in the game and tech the player holds in their hands as they play. In both cases, the game is pushing the series to interesting places. In terms of the tech in the game, without spoiling too much, it's safe to say you may notice, very early in the game, that one of the game's shopkeepers, he who flies around in a store held aloft by propellers, appears to have a super-computer in his otherwise fantasy-medieval shop. There, the wonder is what Zelda could be like if its world involved more of the digital. No, Link doesn't go to some high-tech future city in Skyward Sword, but repeatedly the game explores the usefulness of items and colorfulness of characters that exist in a world of technology that has gotten past the slingshot and the pumpkin-sized bomb. If the tech in the game is veering ever so slightly toward the digital, the tech around the game veers fascinatingly toward the analog. Skyward Sword requires advanced motion control tech that didn't ship with the original Wii. It uses MotionPlus sensors, which can be either plugged into a Wii Remote or just used via the Wii RemotePlus which has them baked in. The newer tech can read hand and arm movement more precisely and can distinguish wrist flicks from arm swings, diagonal flicks from horizontal or vertical ones. The developers gleefully exploit this with devilish enemies who sometimes block all but a single vulnerable angle, with ropes that need to be cut a certain way, to, more abstractly, the supplying of Link with an unmanned aerial drone that he can use to survey a dungeon and attack his foes (the drone thing is not as ripped-from-the-headlines as it sounds). The motion control never feels gratuitous, though the tech is often confounded when you have to switch from sword-swinging to some sort of pointing gesture (meaning, switching from combat to exploration). It usually needs to be re-centered with a tap of the Remote's D-pad, a minor aggravation that is easily manageable but a reminder that this tech isn't perfect. The game's requirement for players to use precise motion is a requirement for the player to have skill. You will fail if you flail. You will succeed if you are thoughtful, have good reflexes and can keep your cool. The angles of your swing matter, and, in that respect, the game does feel less digital—less binary—in its interactions than most Zeldas do. Typically in Zelda there is a problem—a puzzle or an enemy—and usually just one way to solve it. You either solve it or you don't. You can dispatch an enemy with a variety of different weapons, but even they either work or they don't. The motion controls in this new Zelda convey a perhaps illusory but exciting sense that things are less definite, that accidents can happen and that luck might too. They prove that gradients of skill do factor in. This time, the player will feel themselves gain power not strictly through the accumulation of series-standard gadgets but through the practice of physical maneuvers and the improvement humans generally enjoy the more they do something. The spirit of the game's skill-based motion controls sits well with the surprising idea to give players more choice in this Zelda. Players can upgrade their items through a vendor in Skyloft and turn a single slingshot into one that shoots three pellets simultaneously. They can upgrade their bug net and their shield and other items. They can buy potions, as before, but can also collect bugs and use them to upgrade those potions and receive new, temporary status effects. They have a stamina gauge to watch, which restricts Link's strenuous activity and lets players decide how much they want to push him to run or do a special attack before waiting the couple of seconds it takes to recharge. 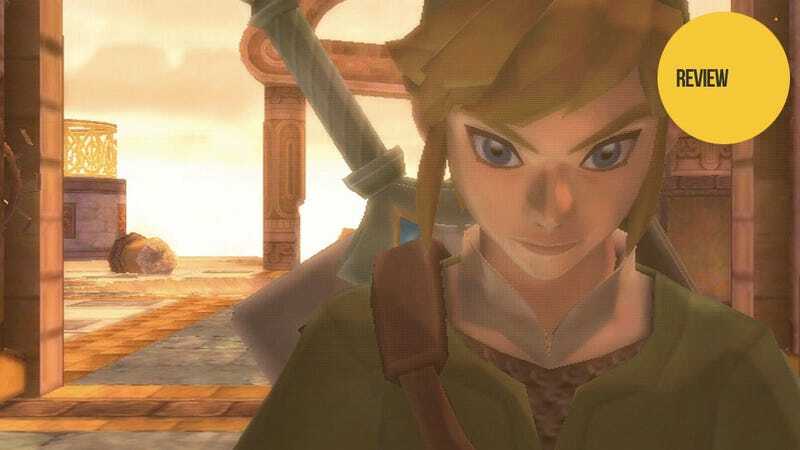 In these and other ways, the player can customize their Link differently than another player would, creating the unusual result that one player of this Zelda can compare notes with another player and discover they've built up their hero in different ways. Even some of the game's low-key sidequests have branching endings, which allowed me and Giant Bomb's Patrick Klepek to discover that some of the micro-stories in my Skyward Sword ended differently than in his. Player-driven character customization and the elevation of the relevance of player choice is Role-Playing Game 101, of course. But Zeldas have veered far from RPG standards for a while. This return, which empowers gamers even in this finely developer-crafted game, feels both like an interesting homage to the broader genre's past and an acquiescence to the modern gamer's desire to feel like their decisions have consequences in the game they play. This is subtle but exciting shift for Zelda, one that won't be hyped on the game's box but is among the most significant real changes in the game. While the game does empower the player, the respect it shows its gamer is curiously inconsistent. Skyward Sword is stuffed with hint systems, rumor systems and even a magical stone that can play videos that show how to solve many of the game's challenges and quests, all of which are optional and easily ignored. There's nothing wrong with that, but it's strange to see so much attention paid to helping challenged players in an unobtrusive way in the same game that requires every player to sit through the same text-box, menu-loading item descriptions that interrupt the action every time a bug or collectible treasure is found—make that not every time, but every first time you find any bug or treasure when you've loaded the game from a save file. It's like they think you don't remember what a butterfly is or need a reminder, even though you‘ve caught 50 already. It is a maddening insult to the intelligence of the game's players who are otherwise asked to remember so much. It is more frustrating that it has been like this in Zelda after Zelda, making me wonder what kind of feedback the series' team listens to. The range of things you do and the beautiful, varied sights you see in Skyward Sword are stunning. They withstand even Nintendo's revealing promotional campaign for this game and still sequester many secrets from those who have watched trailers, studied screenshots but not yet played the adventure. Within this range of hyped and unhyped elements are some welcome tests and experiments, signs that the developers are dabbling. One example is the option to both explore the game world and use projectile weapons from a first-person perspective without being locked in one place, which I believe is a series first. The game also successfully proposes a new gesture-based inventory system that gives Link access to a dozen or so inventory items without pausing the game, all triggered in about one second by a skilled player, using a single button press and directed flick of the wrist. Skyward Sword just begins to scratch at the exciting (really!) consequences of a video game character being able to access such a broad array of inventory items on the fly in the middle of an action sequence. We don't usually get that in games that aren't controlled with a keyboard. Perhaps this is an area where motion gaming can benefit all types of players. Link is a strange character in this game, though even calling him a character is inherently strange. Zelda games have never been packed with story and never done more than sketch Link's identity. This one, too, is light, setting Link up as a student in an academy for bird-riding knights and the eventual rescuer of the daughter of the head of academy. Of course, a great evil also threatens existence. There isn't a much more complex scenario in other Zeldas but playing this new one shows just how much the older games did with so little. Prior games gave Link a dying uncle to avenge or a grandma to visit. In Ocarina of Time we controlled the precociousness of a little boy who would travel seven years into the future to rescue a grown princess. In Majora's Mask we controlled the Quixotic efforts of a hero who repeatedly failed to save a despairing world only to turn back time and try again and again. Those simple situations gave Link different shades of boyish heroism in a world of evil. They defined his valor and, in retrospect, made him seem more of a specific, emotional character than he does in Skyward Sword, where he comes off less as a character and more as an avatar. In Skyward Sword, Link is the blankest he has been, still voiceless and, this time, he cedes the emotional journey in the game to the woman the series is named after. In the long term of the nearly 50-hour game this is more of a difference than a fault but it is also one of the reasons that the start of this game is so hard to be energized about. Link is not an easy hero to be excited to control, this time. He's a boring kid who lives in a dorm. Zelda is so much more interesting, as players will learn and it's tough, frankly, to see what she sees in Link. I stretched my time in Skyward Sword as long as I could. I didn't want it to end. I both enjoyed the game immensely and felt the anxiety that no one else makes single-player games like this, long hand-crafted adventures that show you beauty, match wits between you and the level designer and, well, have the polish of a game made by a company that can afford to take the half-decade that might be needed to make a great video game. If no one else makes games quite like this, however, I wonder again whether even Nintendo should. This formulaic approach to Zelda, after all, stretched interestingly as it is in Skyward Sword, is a relatively new series cliche. Zelda wasn't always Nintendo's James Bond series, not for all of its 25 years. Its design wasn't always a masterful execution of filling in the same blanks in new ways. In the first 15 years of Zelda gaming, innovation had meant changing from a game seen overheard, to one seen sideways, to one played from behind the character's back in a three-dimensional world. Innovation had meant that one adventure was set in a world that hid a photo-negative version of that world that could also be explored. Another adventure replaced the game's land for water and was drawn like a cartoon. One old Zelda game was portable; and the next two portable Zeldas combined to form a larger hybrid game. (Those two were directed by the guy who directed this new one, by the way.) One console Zelda made some of the series' bad guys into good guys and lasted only 72 minutes, 72 minutes that needed to be re-played differently again and again. Another was not just for four players but was meant to be played on five gaming machines at once. Zelda games, in other words, were routinely, radically different. In the past 10 years, however Zelda innovation has most often meant things like swapping the horse out for the train or, in this case, for a bird. Not that the train Zelda wasn't really good, which is sort of the point... even formulaic Zeldas can be magnificent, as is the case with Skyward Sword. Nintendo and its fans will have to decide whether formula-tweaking rather than re-invention is the better Zelda standard. Great games can emerge from either approach, which is something I happily came to peace with, halfway through this new game. There is much that I find extraordinary about The Legend of Skyward Sword. It is masterful in pleasing the player, in surprising them, in asking them to try new things and in providing in its art and music an aesthetic range of a quality not seen in the series and even rare in the medium. It is also impressive for the most unusual fact that it is good at being long. So many video games are long, but they stretch poorly. Skyward Sword tiptoes toward the sin of forcing players to repeat content to stretch the game's length, but that is minimized in favor of throwing new ideas into the mix even into the game's final few hours. The excellent art direction supports the game's long-playing-time appeal. Its lovely specificity ensures you will notice and remember little curiosities—a statue on an island; a strange propeller in the desert, a gray cube on a massive tree root—in the early hours of this game and remember them late when they matter or when they're fun to reminisce about in the many mental postcards you'll make playing this game. The Legend of Zelda: Skyward Sword is not a radical game. It is, in its structure, no surprise. It is hard to explain why it is wonderful. From outside, and even sometimes from within, it simply appears to be more of the same. It is not. It is single-player excellence, improved—yes, improved—by motion control, drawn and scored with great artistry and packed with the pleasures of interacting with what amounts to one massive 50-hour hand-crafted puzzle. This is not a game that would convert a Zelda skeptic wary of bows, arrows and treasure chests, but it should thrill anyone who has ever considered being a fan. The Legend of Zelda: Skyward Swordwill be released on Nov. 20 for the Wii. Nintendo provided Kotaku with a copy of the game. Played it for 47 hours, didn't give the kid's love letter to the person in the bathroom who was out of toilet paper. Yes, that's a sidequest.